Nick's biggest screw-up becomes his most favorite possession. Nick’s biggest screw-up becomes his most favorite possession. The morning air was cold, but the walk in heated me up far too quickly. Sweat dripped down my back as I climbed into my blind and perched on my stool. This would be a problem later. Only “later” would arrive a whole lot sooner. An hour passed and I began to shake. The moisture beneath my layers sent a chill from toes to fingers, making it difficult to remain still. And “still” was what I needed to be to do what needed to be done. I looked to the woods – ambitions renewed. Everything seemed perfect. My longbow felt solid across my lap. My broadheads seemed extra sharp. My shooting lanes – extra wide. I was ready. Time passed, light came, and the woods awoke. A mixture of greens, browns, and golds melted together in the breeze. The morning quiet changed to not-so-quiet. Birds hopped and chirped. Squirrels commenced their foraging routines and I could hear the creek babbling behind me, as if it hadn’t before. I knew this time all to well. Every hunter knows this time. It’s when things happen. A shuffling of dry leaves fooled me into a sharp head turn – a sin for any bowhunter. The shuffling gave way to soft thumps. “That ain’t a squirrel.” I thought. My skin goosebumped. The doe sprang forward. I fumbled for my longbow and somehow – by God’s grace – found my string. She trotted through my first lane and headed toward my second without giving me time to think. A group of young trees and a mess of brush separated the two. She stopped suddenly behind them, nose up, sniffing the air. A second doe arrived in similar fashion and the situation worsened. She was out of range and knew something was amiss. Steve’s blind provided ample cover, but it wouldn’t be enough to hide me from the wary eye of an alert Georgia doe. I didn’t like my odds. Not one bit. I was conflicted. If I was patient, the first doe might move into my lane before the other made me. On the other hand, she could double back, or veer off to the North with the other. My second option – slipping an arrow through the brush – wasn’t ideal either. My bow – raised and ready – started to shake. My heart rate jumped. I could feel the sweat well up in my palms. The doe’s leg came forward and a small window through brush to heart emerged. My mind blanked. The hunter took over. The does bolted into the brush. Squirrels scurried to the safety of the trees around me. The white noise of the woods faded. 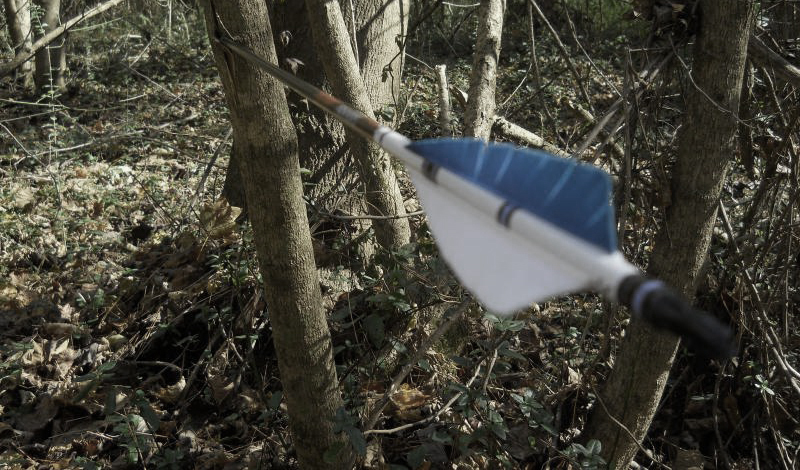 All you could hear was my arrow, thrumming like a coiled doorstop, in a tree eight yards away. I sunk into my seat, my heart beating furiously in my chest. The lead doe glanced back out of curiosity, but the parting shot belonged to her and her alone. I wouldn’t get a second. I finished the water, yanked my arrow out of the tree, grabbed my bow, hopped into the creek and waded it to the river. It was a beautiful morning. The sun was bright and the river was loud. I loved a loud river. Steve and Thom were waiting for me on the bank where we’d crossed that morning. “Thought I saw a couple does run by at around nine too.” Thom added, grinning sheepishly. I could feel the blood rush into my cheeks. Steve shot Thom a grin and I could tell he didn’t hear a word I said after “tree”. Thom and I were back in Michigan a few weeks later. He called to tell me he had something for me and to drop by after work. I thought this was odd and arrived to find a weird looking “trophy” sitting on a table. It was a tree, mounted to a plaque, with an arrow sticking out of it. It didn’t take long to figure out this was the tree. I threw Thom a “What the hell?” look and discovered I was staring into the lens of his phone. “Steve’s going to get such a kick out of this” he said. Sometimes a little fib to friends will grow legs and kick you later. While meant to be a gag gift, Steve’s plaque was beautiful. He had located where I’d shot the doe, found the sapling, and mounted it on a plaque with my favorite Hemingway quote: “We are all apprentices in a craft where no one becomes a master.” Thom donated the arrow. It was actually one of his I’d shot in half while screwing around in Steve’s yard before we left. My “Major Award” is now one of my most prized archery possessions.